VOA's Kane Farabaugh, who is in Ferguson, says police have arrested at least two people after a scuffle ensued when protestors tried to take the center of a busy intersection "and police moved in to disperse." He described the situation as "very tense." 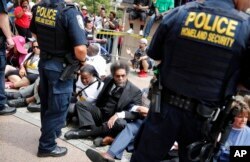 Famous author and academic Cornel West was among those arrested. Cornel West, center, joins other protesters sitting on the steps of the Thomas F. Eagleton Federal Courthouse as members of the Federal Protective Service stand watch, Aug. 10, 2015, in St. Louis. Police Chief Belmar said the wounded suspect, Tyrone Harris Jr., was among six who fired shots during Sunday's protest, which until that point had been a peaceful street demonstration commemorating the year-ago killing of Michael Brown. He was killed during a heated street confrontation with a white police officer who months later was cleared of wrong-doing. Belmar told a news conference that the outbreak of violence was "an impediment to positive change." He said police first increased their presence in that area after reports of looting, and that some people threw bottles that shattered near officers. He also reported one officer was injured by a flying brick Sunday night in Ferguson. A woman reacts after shots were fired in a police officer-involved shooting in Ferguson, Aug. 9, 2015. Earlier Sunday, the situation was peaceful as marchers began at the site where Brown was shot by Ferguson officer Darren Wilson on August 9, 2014. The demonstrations that followed Brown's killing threw the St. Louis suburb into the national spotlight and sparked calls for better treatment of minorities by police.